Yesterday I ride from Epsom in Surrey to Wokingham in Berkshire as part of my cycle tour before the Rugby World Cup final. 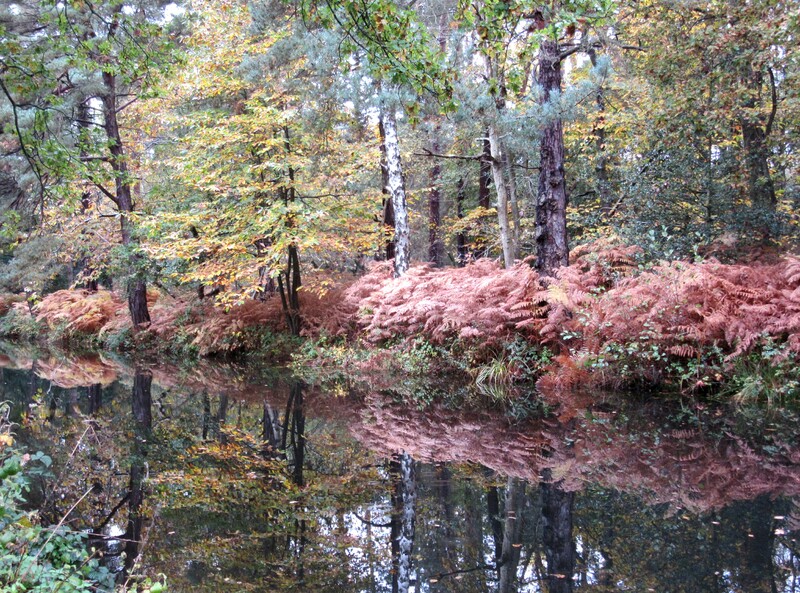 During the ride I had a section of stunning autumnal beauty which will live long in my memory. 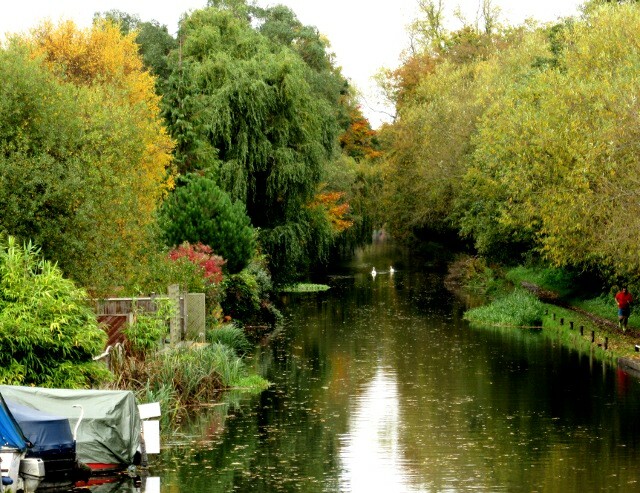 To travel along the side of the old Basingstoke Canal from Byfleet to Deepcut was like spending a day inside a series of paintings, or a perfectly designed Japanese garden. 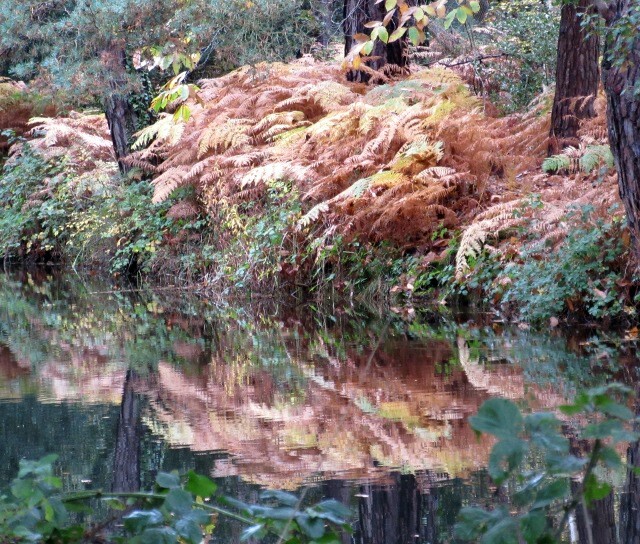 The colours of the trees and the undergrowth mirroring on the still waters of the canal were like a series of tableaux coming round each bend until I was almost experiencing sensory overload. This intensity was maintained for nearly 20 kilometres, giving me a period of absolute delight. With many stops for photos and just to breathe in the images I must have been there nearly two hours. 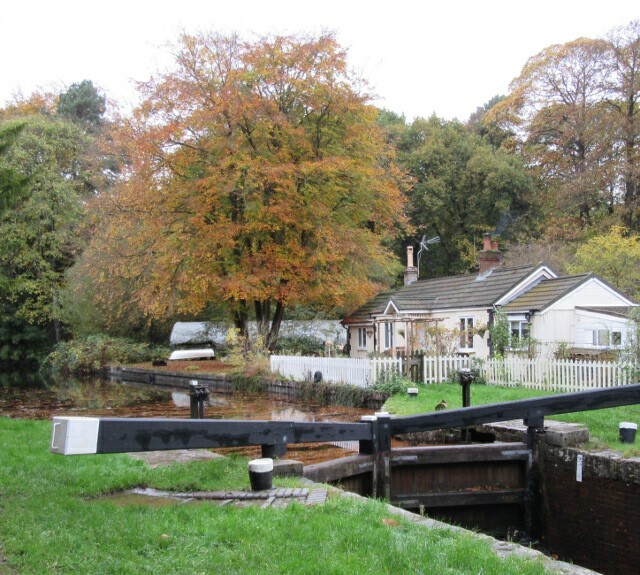 I have written in blog posts from Belgium that I find the big wide shipping canals of Europe somewhat featureless, coming back here reminds me of the intimacy of these small British canals that were built for the narrowboats of the 19th century. Having fallen in to redundancy as trade routes their restoration as cycling and walking corridors is an absolute joy. 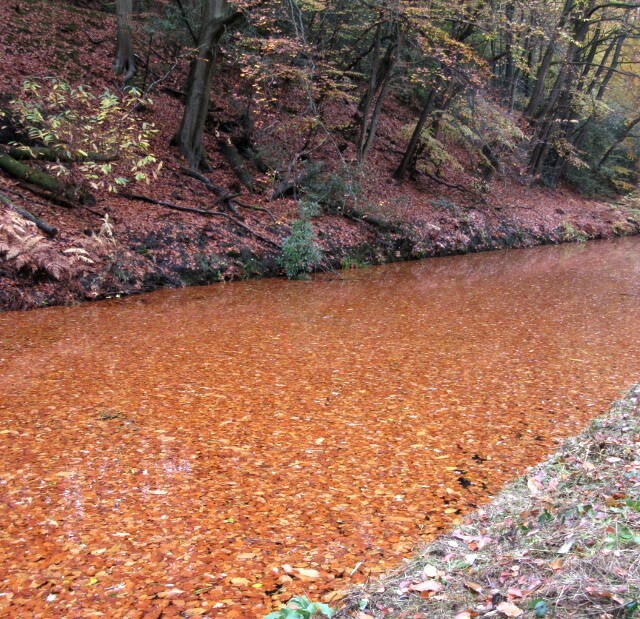 If any of my English readers live near enough to nip down there this weekend for a ride or a walk I say take it now, I guess I have been lucky enough to be there just as the autumn colours reach perfection. 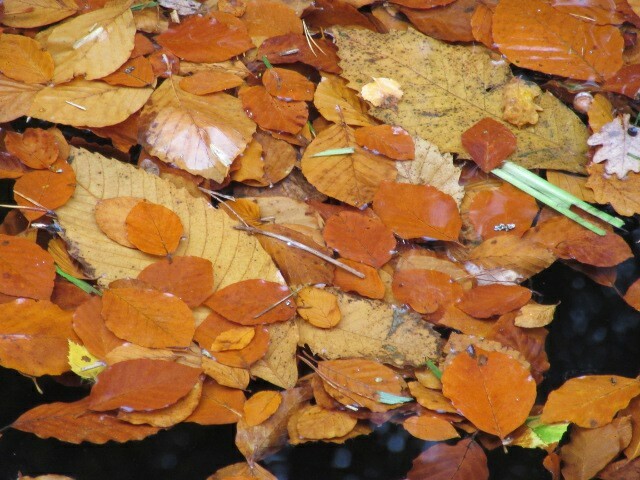 Oak, silver birch and horse chestnut all make their contribution but the stars of the show are the golden beeches, in some places the leaves have formed such a dense layer on the water that they have formed a magic carpet of orange that could tempt the unwary to take a walk on the surface. The camera alone cannot capture it, the temptation is to portray it as an impressionist painter, perhaps Monet would have done it justice. 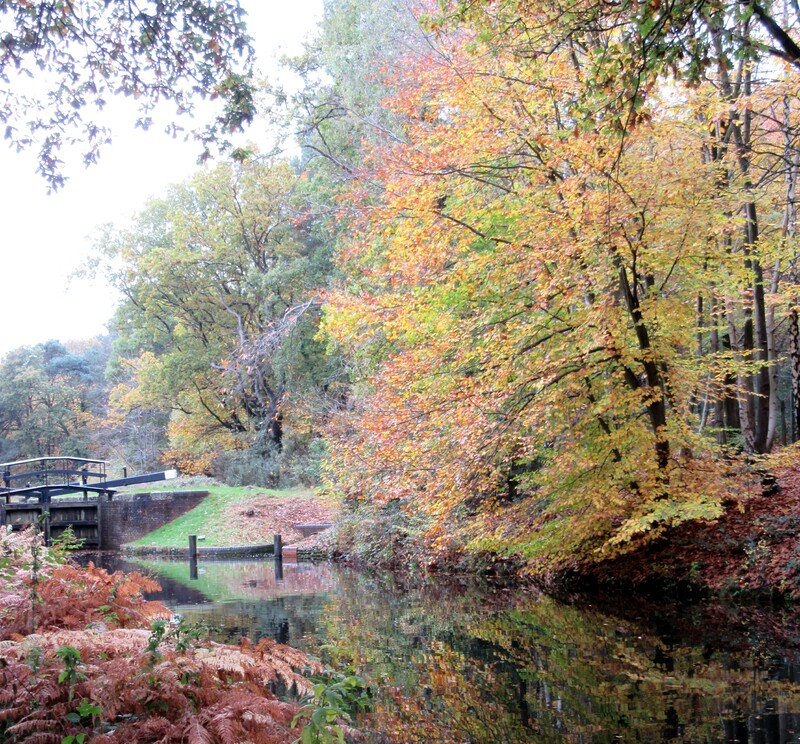 However if you do go to visit the Basingstoke Canal as it passes close to Woking you might have to look out for another name. 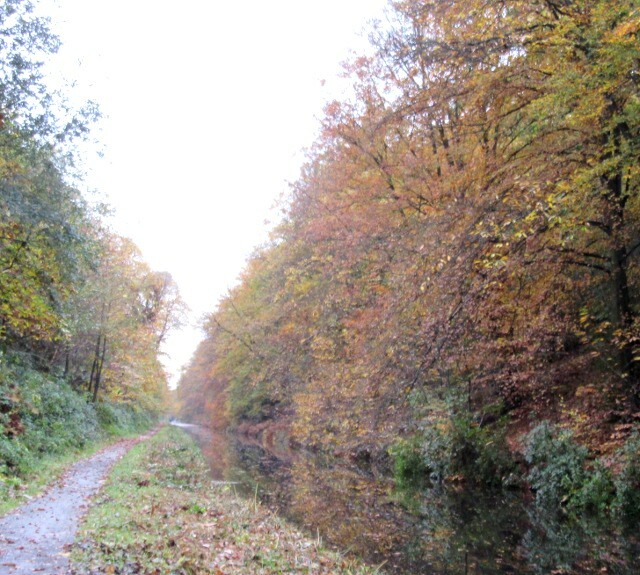 Because as it passes through Woking the canal towpath is called the “Saturn Trail”, which gives me a lovely link to the author H.G. Wells whose quote inspires the title of the this blog. Back in 2008 I was on the board of a group called Cycling England who were advising the government on their cycling strategy. As part of our work the Board selected the town of Woking to get extra funding to become a so called Cycling Town, beating off over 70 other applicants. 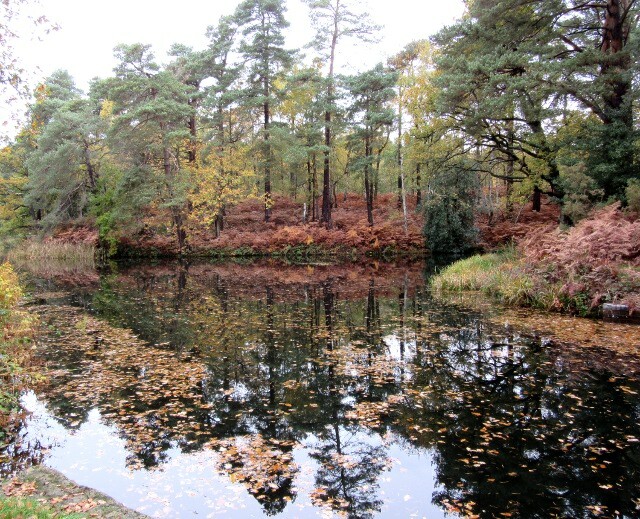 One of Woking’s main strategies was to create a cycling network and learning from other successful towns they decided to give each of nine trails a name and a colour. Inspired by the H. G. Wells novel “The War of the Worlds” which was written while Wells was living in Woking they chose planets and moons as the theme. 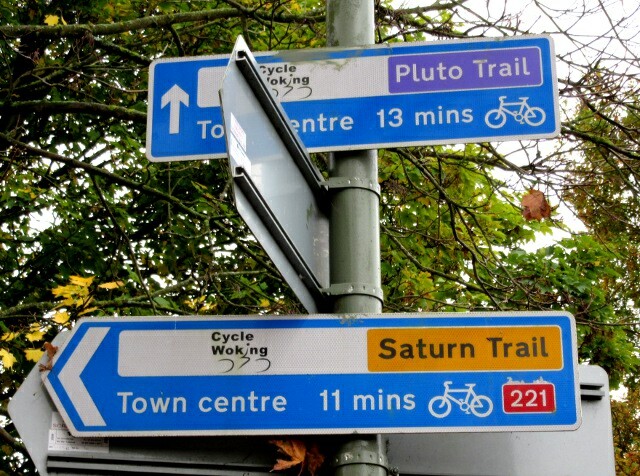 Today the cyclists of Woking can navigate by Mars, Pluto, Ceres and Venus as they move around the town. Which is actually why I chose this route for my ride. When my route planner offered me “Via the Saturn Trail” as an option for the ride I could not resist the chance to catch up with the route and the project and of course to pay homage to H.G. Wells. 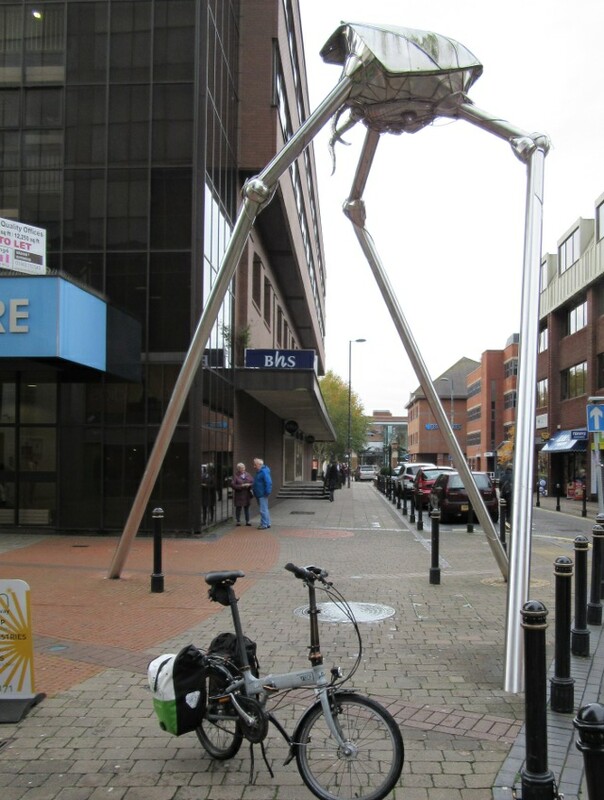 So I also ended up having lunch with a Martian invader, just of the canal in Woking town centre. 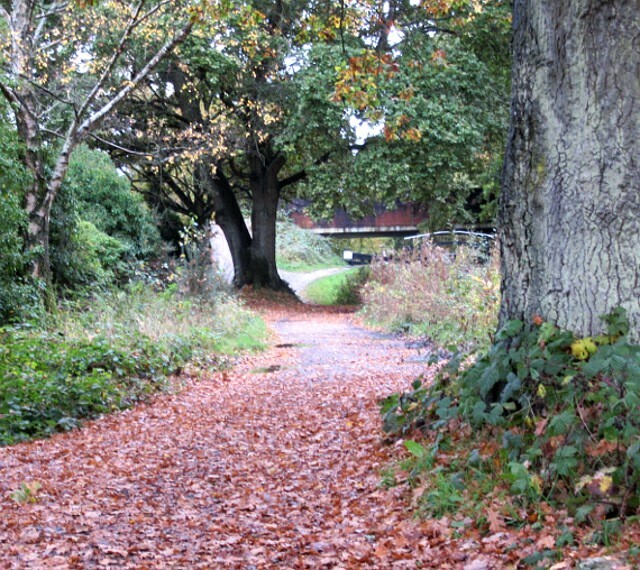 All is not perfect, the surface is not the perfect smoothness of a Dutch cycle path and the heavy leaf fall made some sections of the route a bit slippery, but because it is shared with walkers that is probably a sensible bit of subtle speed management. Of the 20 kilometres the trail section through Woking is the best maintained part of the path, to the far Western end near Deepcut I think it must be out of the scope of Woking’s project because it was wet and muddy, testing the capabilities of a small wheeled bike after the rains of the last two days. But as that section offered possibly the very best of the views and was absolutely deserted I can say that it was worth every splash and wobble. Which makes it time to say thank you. 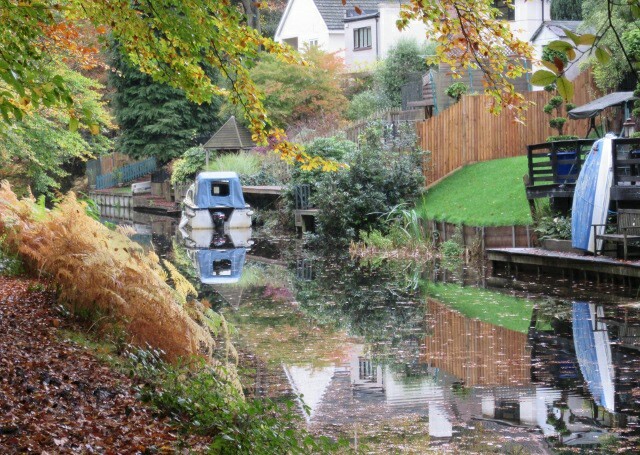 Thank you H. G. Wells, thank you to our Victorian canal builders and especially to Cycle Woking. And to nature’s timing of course. By their efforts and inspiration I was given the finest of cycling hours in an unexpected corner of South East England. Uplifting. I do not despair.